10th Best Online Master’s program in the U.S. and 1st in the SEC by U.S. News & World Report. Masters of Science in Management Operations ranks 7th by College Choice. Ranked 9th best undergrad and 8th best Ph.D. Accounting program in the nation by the 2018 Public Accounting Report, Masters is ranked 10th. Master’s of Science in Marketing ranked #20 and Master’s of Science in Finance ranked #30 in the nation by TFE Times. Culverhouse alum Marillyn A. Hewson is the President, Chairman and CEO of Lockheed Martin and was named the most powerful woman in business for 2018 by Fortune Magazine. She was also named 2018 Chief Executive of the Year by Chief Executive magazine. Dr. Rich Houston, the director of the Culverhouse School of Accountancy and the Hilton Dean Professor of Accounting, was selected as one of the 2018 recipients of The University of Alabama’s highest honor for excellence in teaching – the Outstanding Commitment to Teaching Awards. In October of 2018, the Institute of Business Analytics (IBA) received a nearly $1 million grant from the Office of Justice Programs at the US Department of Justice to develop a data-driven tool to help end users better understand the scope of the opioid epidemic in Alabama and how to intelligently allocate resources. Dr. Jim Cochran, the Culverhouse Associate Dean for Research, was recognized by the Institute for Operations Research & the Management Sciences (INFORMS) with its President’s Award, which goes to those who make “important contributions to the welfare of society” on a “local, national, or global level.” The award was given to him at the organization’s recent annual meeting. 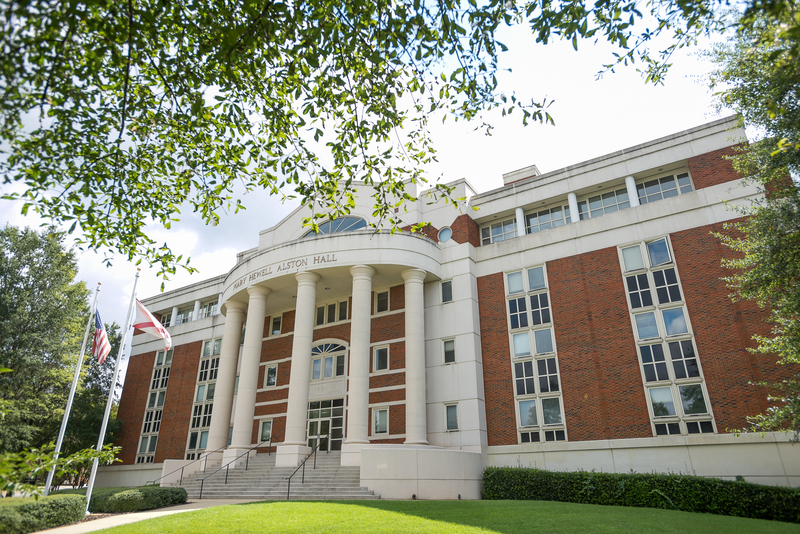 The Culverhouse College of Business at The University of Alabama is celebrating 100 years of transforming business in 2019. The centennial year will feature several special initiatives aimed at helping College alums and friends relive the rich history of Culverhouse while showcasing its plans for the future. The John R. Miller Professor of Management at Culverhouse, Dr. Ron Dulek, was 2019’s recipient of the Algernon Sydney Sullivan Award, which honors one man and one woman of this academic year’s graduating class as well as one non-student. In March of 2019, the Culverhouse College of Business at The University of Alabama took home top professional awards from both the American Advertising Federation-Tuscaloosa at its 50th American Advertising Awards gala and the Council for Advancement and Support of Education at its District III conference in Atlanta. In September of 2018, Culverhouse student, Sara Lang, was awarded the Congressional Award Bronze Metal after giving more than 200 hours of service. This award is the highest honor bestowed on young people by the Senate and House. Nine Culverhouse insurance and risk management students traveled to Chicago in October of 2018 to attend the 47th Annual Gamma Iota Sigma International Conference where they were presented with four chapter awards. The University of Alabama’s GIS chapter received the Well-Rounded Chapter Award and three International Chapter Awards for alumni relations, chapter management, membership development. Felecia Travis, a senior majoring in management with a specialization in HR, hosted a job fair in her hometown of Greensboro, AL on November 2, 2018. Competing against 11 teams from the country’s top business schools, the Manderson Graduate School of Business MBA case team placed second and received $5,000 in scholarships from the Katz Invitational Case Competition at the University of Pittsburgh, Feb. 8-9, 2019. Additionally, the team won the Best School Spirit award! At the 16th Annual Race & Case Competition on March 1-2 of 2019, hosted by the University of Denver’s Daniels College of Business, the Manderson Case Team finished third. The team collected $2,000 in addition to continuing Manderson’s tradition of placing every year in its history of participating in the Race & Case competition. Manderson MBA Team placed 1st at the IDEAcorps MBA Consulting Challenge hosted by Loyola University New Orleans in March of 2019. In April of 2019, the Manderson MBA Case Team placed 1st at the SEC MBA Case Competition in Knoxville, TN winning $10,000 in total prize money. Additionally, the Manderson Case Team placed 1st at the Iowa Business Analytics Case Competition winning $5,000 in Iowa City, IA. The 2018 AIS Team of MIS placed 1st in the SEC Student Cyber Challenge and 2nd in the AIS Student Leadership Conference. Manderson MBA Team placed 1st in the 2018 Race and Case Competition and 2nd in the 2018 KeyBank Minority MBA Case Competition. UA STEM Path to the MBA students are participating in the prestigious EcoCAR Mobility Challenge by the U.S. Department of Energy, General Motors Corp., and MathWorks. The UA team is ONE of 12 selected for the EcoCAR Mobility Challenge.